Horses no longer open their mouths, but the sound they make when they open their mouth is still present. Usually right after you spawn a horse or the horse is idle you will see these animations followed by the sound they make when they open their mouths. (The neigh or something) sound plays but the horses mouth never opens. 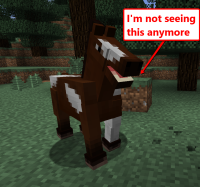 Notice that the horses' mouth never opens every time you spawn a horse or when the horse is idle. What animation I'm talking about? Notice the horses mouth just opened. MCPE-19193 Baby mobs no longer make idle sounds.